Around 1980, I crossed Sinningia reitzii with several other species. One was S. cardinalis. The result was a plant whose leaves looked more like those of S. lineata than those of either parent, but whose flowers look like those of S. cardinalis without the galea. The flowerstalks have well-defined peduncles, like those of the reitzii parent. I was obviously not the first one to make this cross, since Perret et al. mention in their paper that Carl Clayberg had obtained fully fertile hybrids from all crosses between a group of species in the Dircaea clade, and this group included both S. cardinalis and S. reitzii. The plant has a large tuber which continues to grow with age. It goes completely dormant in the winter. All stems are deciduous. The leaves are plain green and slightly fuzzy. The shade of green varies depending on culture. Gene Sussli has a cutting from this plant, and the leaves on his plant are almost always darker than mine. 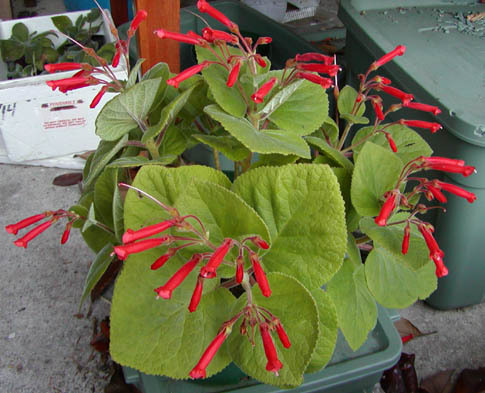 The flowers are bright red and are borne in terminal inflorescences with peduncles. They have no galea. The stems are a muted purplish color, that might be a reflection of its reitzii ancestry. The stems bear faint streaky markings that do not much resemble the streaks on the stems of S. lineata and its hybrids. I must admit I have some reservations about the identification of this plant. All the other hybrids I have made with S. reitzii and S. "Black Hill" have leaves which are at least somewhat dark green; none of the others have the bright cardinalis-type green that this one has. Another source of doubt is the determinate growth. I have two three-species hybrids whose ancestry is 1/4 indeterminate and 3/4 determinate, yet are indeterminate, suggesting that the indeterminate habit is very dominant. This plant has one indeterminate parent (S. reitzii) and one determinate parent (S. cardinalis), yet is determinate. That makes me wonder. Yet another point: most S. reitzii hybrids retain at least a stub of the stem on the tuber when they go dormant. This plant does not. The deciduous stems separate cleanly from the tuber. The cross was done so long ago that I have no way of assessing how accurate I was about identifying it. I don't even know which species was the seed parent (although it is pretty clear that this plant has S. cardinalis in its ancestry). If the second parent isn't S. reitzii, it would have to be something with peduncles -- perhaps S. lineata. Obviously, I should repeat the cross. My misgivings about its heredity notwithstanding, this is an excellent plant. It blooms heavily and has a much tidier growth habit than S. cardinalis, despite being quite a bit larger. Like most of my sinningias, this plant grows outdoors, unsheltered from the weather, even in winter. In the winter of 2007-2008, this plant was near the back of my yard. At some point, it was blown or jostled off its stand onto the ground, upside down. I didn't notice until spring (May 2008). The result you can see in this picture. 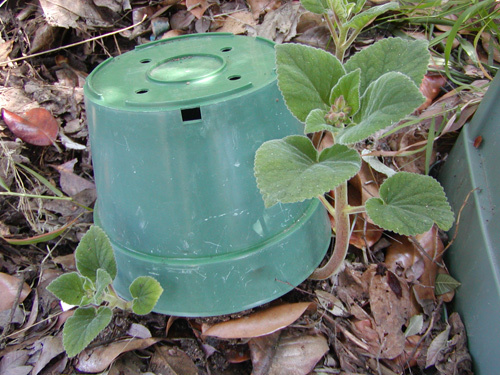 The plant sprouted normally from the tuber, but the three stems all made an immediate U-turn as soon as they cleared the edge of the pot. One of the stems I cut off and gave to Gene Sussli, who rooted it and now (2017) has a large, vigorous plant of his own. Fertility This hybrid is fertile. Taxonomic group Both parents belong to the Dircaea clade. Nectaries Five, separate except for the dorsal pair, which are larger than the others and fused.